Home T-Rex Effects Replay Box Delay Give Away! T-Rex Effects Replay Box Delay Give Away! It’s time to fire up another great give away here at EffectsBay! So let’s start things off with a great T-Rex Effects Pedal. A while back, the great crew at T-Rex sent me a few pedals to check out, and out of the batch offered a couple for give aways. Well, I thought I would save the best for the last.. the T-Rex Effects Replay Box Delay. The T-Rex Effects Replay Box Delay is a crazy good delay, in a TINY enclosure for a delay with the features available. Here are some features of this pedal – Stereo in/out. Volume control. Mix control. Repeat control and Tempo control (knob and tap tempo footswitch). You can control subdivision with toggle (quarter, triplet and dotted eighth). So let’s talk about the give away. First.. I want to thank Musiquip and T-Rex for offering this guy up. Definitely, check out T-Rex Effects. They have lots going on, and their pedals are top-shelf all the way! Check out their site, Facebook and Twitter! 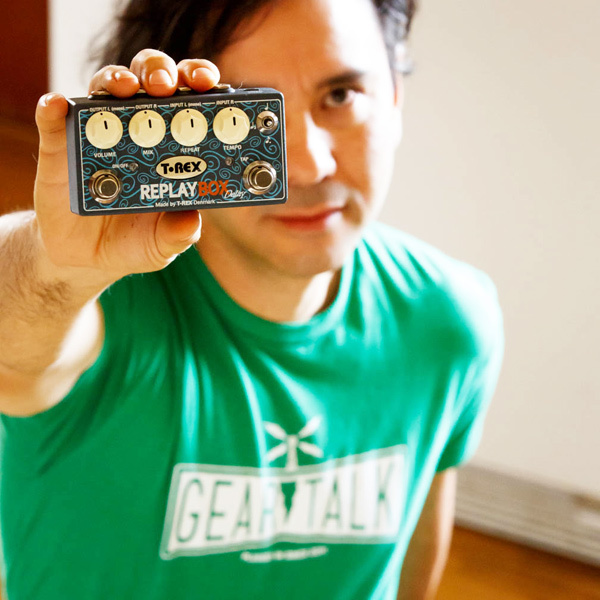 The T-Rex Replay Box Delay pedal normally sells for $250, so this is a great opportunity for someone!!! I’m going to a random entry on February 11th. I will email that random entry asking for the answer to the question listed below. You will have 24 hours to respond with the answer. If the 24 hours passes and I don’t hear from that finalist, I will select a new random entry and repeat the process until I receive confirmation from the winner. This is open to everyone. Yes, that means international! Also, one entry per person. Please read that last sentence again… “one” “entry” “per” “person”. The submission form will be open until February 11th (Wed) 2PM MST. On top of that, I’ll sweeten the deal. If you like EffectsBay on Facebook AND you’re chosen as the winner, I’ll throw in a large Pedal Label pack for FREE! So, it’s pretty much a no-brainer to like EffectsBay on Facebook! Just click the ‘likes’ below. My JAM pedals Delay Lama is phenomenally LUSH. Its analog & hand made, & awesome.. OH Easy as hell layout too..
I’ll bering my buds in a minute.. HEY GVG..
That’s very strange. Can you try again? I’m getting a ton of entries. Taylor Michael Ryan Maggie Ryan Check this out! !